Notes for mathematics for physics chapter of class 11 physics. Dronstudy provides free comprehensive chapterwise class 11 physics notes with proper images & diagram. A key idea in mathematical analysis and in Physics is the idea of dependence. One quantity depends on another if the variation of one of them is accompanied by a variation of other. 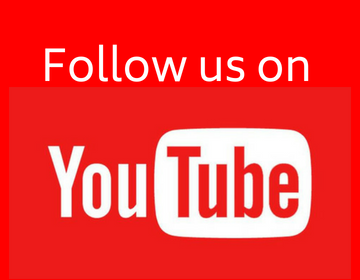 Mathematicians speak of the independent variable and the dependent variable. In Physics, it is better to think in terms of cause and effect or interdependent quantities. Let us consider the distance covered by an automobile, moving at constant speed, as a function of time. Data for a particular example of such motion may be presented numerically, as in the following Table. The exact mathematical relationship between the time and the distance in this example is not immediately obvious while examining the table. This is one of the disadvantages of tabular presentation. Although the numerical values can be precisely specified, they do not at once convey the clear picture of how the variables are related. A graph does this job much better. Let us plot the same data on a graph as shown in the figure. 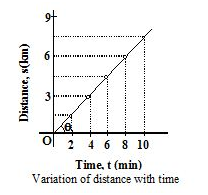 The independent variable - time is plotted horizontally; and the dependent variable - distance is plotted vertically. Each pair of numbers in the table gives a single point on the graph. It is immediately obvious that the points may be joined by a single straight line. The equation that fits the above tabular and graphical data is s=0.75t. Where s represents the distance in kilometre and t represents the time in minutes. This equation, lacking dimensional consistency, is better replaced by s = vot. The equation provides the most concise expression of a functional relationship. tan q = s/t = vo is the slope of the line given in the above figure. Note that the quantity tanq is a dimensional quantity in this case, length divide by time. We always measure slopes as a vertical increment divided by a horizontal increment on a graph, each increment being measured in the appropriate unit for the quantity in question. With this understanding, the slope of a line is independent of the scales choosen to prepare the graph. Slope has a simple physical meaning. It is the rate of change of the quantity being plotted vertically with respect to the quantity being plotted horizontally. Mathematically, slope is derivative of the function. Let y be a function of x. If to a small increment Dx of x there corresponds a small increment Dy of y. Then is called the derivative of y with respect of x and is written as or or . 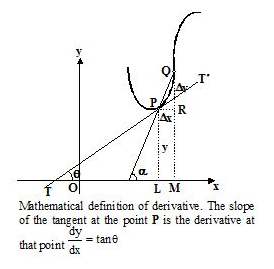 is the slope of PQ as along the curve , and PQ becomes tangents TPT' at P.
is the slope of tangent at P.
The process of finding the derivative of a function is called differentiating the function. Differentiation obeys several simple rules that are worth committing to memory. (i) The derivative of a constant times a function is the constant times the derivative of the function. 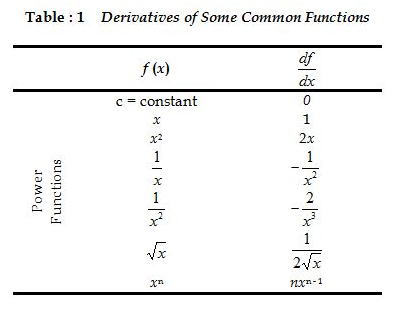 (ii) The derivative of the sum of the functions is the sum of their derivatives. A function f (x) is said to be increasing if f (x) increases as x increases, and decreasing if f (x) decreases as x increases. if then f(x) is decreasing. As shown in the figure, when f(x) is increasing, the tangent to the curve at any point, say P, makes an acute angle with positive x-axis. The slope of the tangent is positive. As shown in the figure, when f(x) is decreasing, the tangent to the curve at any point, say P, makes an obtuse angle with positive x–axis. The slope of the tangent is negative. 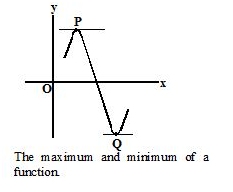 As shown in the figure, at the point of maximum and minimum of a function the slope of the tangent at the point is zero. (b) f'(x) changes in sign from negative to positive when x passes through the point x = a. In other words, the second derivative of the function at x = a is positive. i.e. Integration is the inverse operation of differentiation. Integration of f(x) consists in finding the function I(x) whose derivative is equal to f(x). In the above expression, f(x) is called the integrand; is the symbol of integration and dx indicates the variable of integration. The symbols on the right side of equation together represent a single entity. It does not mean that f(x) is multiplied by dx. The function I(x) is also known sometimes as the antiderivative of f(x). If the derivative function is f(x) = 0. 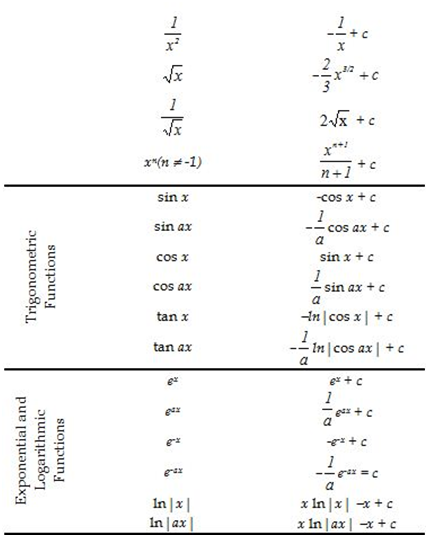 Find the integral function I(x). Since a function whose derivative is zero is a constant, therefore I(x) = c, where c is any fixed number. 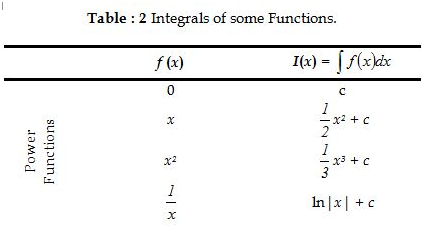 The integrals of some common functions are listed in the Table : 2 of integrals. Note that moving backward in this table (right column to left column) is equivalent to differentiating. 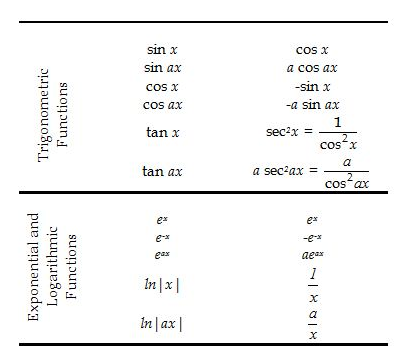 In the same way, moving from right column to left column in the Table : 1 of derivatives is equivalent to integrating. 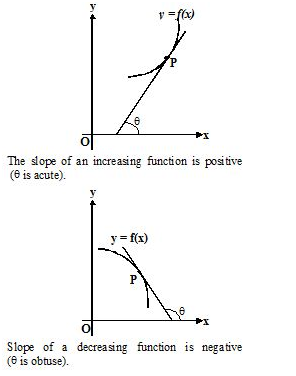 As we have learnt the graphical interpretation of differentiation as finding the slope of a curve. Integration also has a simple graphical meaning. It is related to finding the area under a curve. If a function f (x) is expressed graphically in the form f (x) vs x, the area under the curve between the limits a and b means the area bounded by the curve of f (x), the x-axis and two lines x = a and x = b. The area under the graph of a positive function is defined to be positive. The area under (actually above) the graph of a negative function is defined to be negative. As shown in the figure(c) , positive and negative area add algebraically and may cancel.